in action and hear Barbara speak? and download two free chapters of the book. Check out our many case studies and client testimonials! organization develop our collective CQ to lead successful and sustainable change? changecatalysts.com to start your journey. Interested in having Barbara speak for your company or organization? Whether you have school-age kids, are a continuing student yourself, or anywhere but under a rock, you’re probably experiencing some aspect of the annual ritual: watching the TV ads to gear up the kids, ordering books and supplies, or even getting stuck behind school busses! No matter your role, it’s always a time of mixed emotions – sadness to see the summer end, trepidation about new teachers and tests, excitement to see old friends, potential to make new ones. We’re reminded of the popular Chinese symbol again – the one that signifies both danger and opportunity – the dual sides of any change. Preparing my kids for their new scholastic adventure this month, I was struck by lessons we can draw from the process that relate so clearly to our roles as change leaders at work, as we help ourselves and others we support through to the new reality. 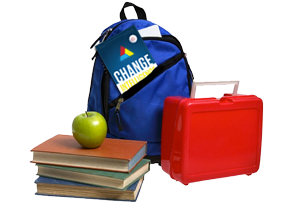 In this issue, we’ll talk about what back-to-school can teach us as leaders. 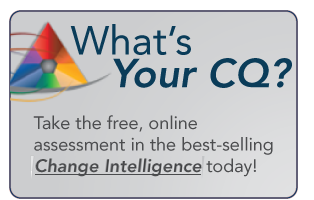 In addition to this feature article, I’ve included a “study guide” below with some recent CQ resources to help you continue your education as a change leader. Here are a few back-to-school stories that you may find relevant in the change challenges you face as a leader, and questions to help you Inspire the Heart, Engage the Head, and Help the Hands and to become even more successful in your demanding role, whether you’re getting your kids on the bus at home or your team on the bus at work! Three of my close friends have children leaving for their first year of college this month. One of the moms is struggling with the “empty nest syndrome,” deeply saddened by her youngest flying away from home. The second has been supporting her son as he leaves his girlfriend and core group of friends he’s had since grammar school behind. My third friend is obsessed with counseling her daughter to actually focus on academics, afraid she’s much more enthusiastic about her new-found freedom and not on her studies. What’s my emotional reaction to the change? While my role may change in ways that I did not choose and would not have chosen, how can I invent a fulfilling, satisfying place for myself for the future? Can I role model taking charge of the change? How can I expand my scope to consider the impact not only on me, but on my team and organizational overall? Are my people focusing more on feared loss than potential gain? How can I encourage shifts in our mindsets to the positives that may result? Can we brainstorm compelling possible futures for us all to live into, that while different, may be even more enriching than the past? Am I balancing celebrating positive possibilities with doing the hard work to get the job done with excellence? Especially when it comes to a positive, welcomed change, sometimes we can be so caught-up in the excitement that we can forget to take on the more mundane tasks required to obtain our return-on-investment and really make change stick. Am I balancing celebrating the change by capitalizing on the forward momentum and laser focusing my team on embedding new behaviors, tools, and systems? I loved the note I received from my daughter’s new 4th grade teacher, “I want my students to be intrinsically motivated. My goal is for each student to identify their own learning goals for the year.” What a fabulous philosophy! Schools these days can be so focused on “testing” to achieve the objectives mandated by State and Federal governments, which while perhaps important to achieve minimum standards, can have the unfortunate effect of causing teachers to teach for testing and not for learning, and therefore turn-off students, smothering their love of learning. I applaud this teacher’s “both/and” approach. Am I crystal clear about my organization’s goals for the change? Have I translated that down to the objectives my team and each member need to achieve? In the context of the overall change goal, what do I as a leader hope to achieve? What is the value-add for me and my work area? How can I make the effort meaningful and relevant for us? Have I communicated the new vision and strategy to my staff in a clear and compelling manner? Have I engaged with them to jointly explore the “what’s in it for me/us”? Have we partnered together to invent tactics that we will own together? Last year during my son’s first year in Middle School, he struggled with getting his assignments completed on time and up to standards. My husband and I came to realize that he was having a hard time making the transition from being in one classroom with one teacher and one “linear” set of expectations to juggling multiple subjects across several teachers with simultaneous and at times conflicting due dates. We realized that we had to make adjustments to help him adjust, from partnering with his teachers to clarifying expectations to devising a process for scheduling his time and organizing his materials that worked for him. Are your people focusing on the right priorities at the right time? It has been said that “leadership is the art of focusing attention.” Especially in today’s workplace, people are bombarded with constant change – in addition to their “day jobs.” Is their work up to standards, or are they struggling to meet new, demanding expectations? How can you help clarify what’s important, what’s urgent, and what can be set aside at least for the short term? Are your people paralyzed, like deer in the headlights, seemingly unable to get into effective action? Perhaps they need a plan, or some structures or tools, to show them the way forward. Do your people seem to be engaged in a lot of activity, but not getting effective results? Try reverse-engineering the key change goals into a winning set of first steps to take to get a noticeable, even if seemingly minor, “win.” That way, your people will regain a sense of control and know they are equipped to achieve success in the future.